Isabella Fox by GigiR - 40 ct. Vintage Sand Dune using various hand-dyed silk threads (Attic Needleworks conversion). Framed by The Stitch and Frame Shop in Rock Hill, SC. Swan Garden by Kathy Barrick - 36 ct. Shadow by Picture this Plus using NPI silk threads (1 over 2). Mary Linley 1829 by The Scarlett House - 40 ct. Vintage Meadow Rue by Lakeside Linens using various silk threads (1 over 2). 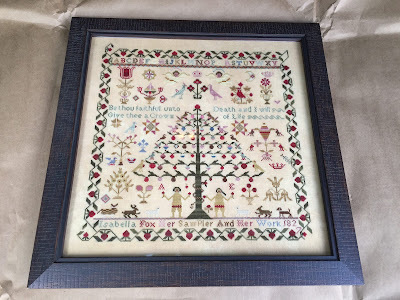 Martha Pudsey by The Scarlett House - 40 ct. Vintage Meadow Rue by Lakeside Linens using Needlepoint Inc. silk threads (1 over 2). Smith Sampler by The Scarlett House - 40 ct. Vintage Meadow Rue by Lakeside Linens using various hand-dyed silks (1 over 2). His Eye is on the Sparrow by Heartstring Samplery - 36 ct. Doubloon by Picture the Plus using Gentle Art and Weeks Dye Works (1 over 2). American Sampler by Plum Street Samplers - 40 ct. Vintage Meadow Rue by Lakeside Linens using GAST and Classic Colorworks (1 over 2). This is the Day by Hands to Work (found in Just Cross Stitch Jan/Feb 2009) - 40 ct. hand-dyed linen (I used Vonna's baking and basting dyeing method) and hand-dyed cotton threads. I used Jan's conversion. Hi Caroline, it was nice meeting you too! I never finished it - it's still a UFO. One of these days I plan to get back to it. Thanks and thanks again for your kind words! You are such an enabler! I have added many of the things you show to my wish list but I love it! 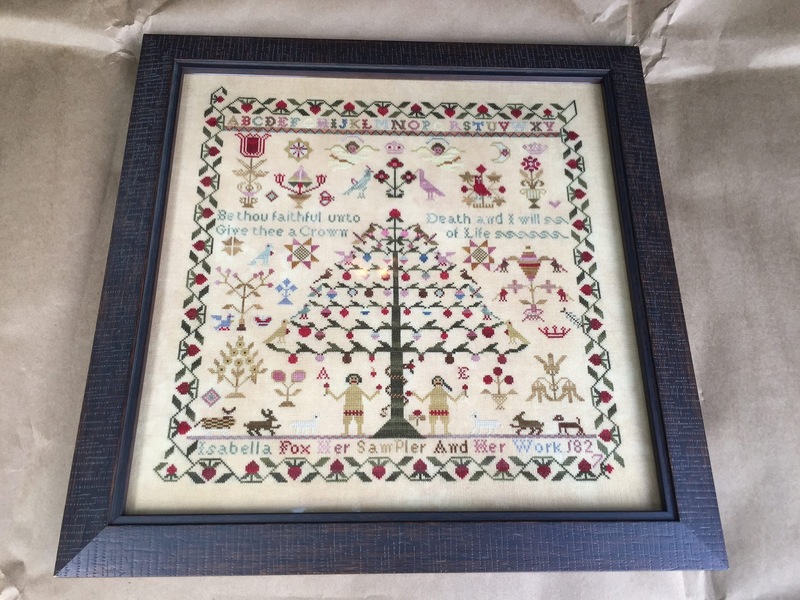 I was inspired by your video showing the"All creatures great and small" and purchased the chart along with the 40 ct linen vintage mocha. I notice that when you start your pieces you begin on the outside instead of center. How do you calculate where to begin? I am afraid to do that thinking that I could end up short of fabric. This is the biggest chart I have ever done and trying to figure out best way to start. I look forward to your next podcast. Thank you! ​If you're doing 40 ct. divide the stitch count by 20 because you will be stitching over 2 threads. For example 300/20 is 15. ​So you know your design is 15 inches wide or high - I then add 4 to that number because I usually have a two inch margin around my stitching. If you prefer 3 inches, then add 6. So once I measure my fabric, I know I need my fabric to be 19" (or 21" for a 6 inch margin) wide or high, so I can either cut my fabric to the exact stitch count or just know that I have enough and start stitching 2 inches in. Hope this makes sense! There are also fabric calculators out there if you do a google search. Love these new projects of yours and can't wait to see your progress! The colors are to die for! Can't believe you got that much stitching done on your Sparrow Sampler and then restarted, twice! But you have to enjoy the journey!